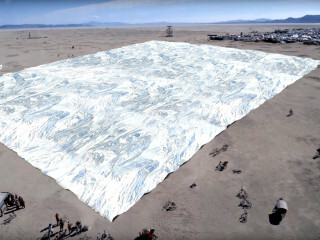 A huge NASA space blanket is moving to Burning Man - Track? !D. The huge reflective installation will bring the waves of the ancient Lake Lahontan back to Playa.The Blanket will be constantly changing it’s silhouette by the power of wind, taking different surreal forms- waves, mountains or some giant fantastic sculptures. 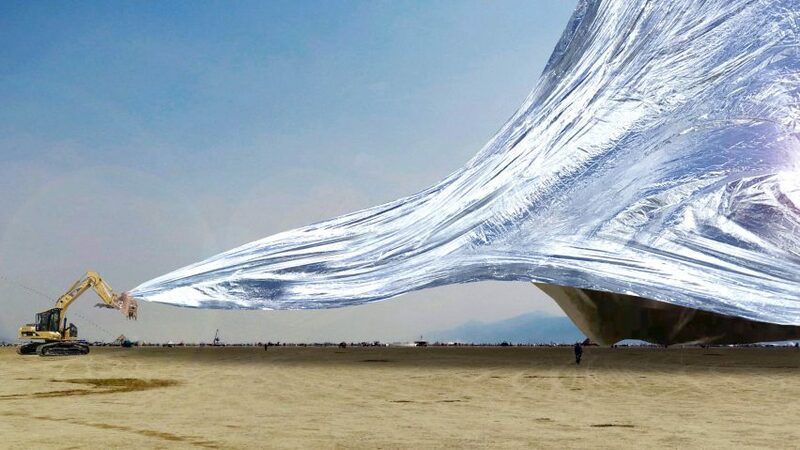 The Blanket is a very light and strong BoPET polyester film canvas 100 by 100 meters, made of 3.350 NASA Space blankets (2,1x1,6 m. each), held together with 40 km of reinforced tape. The silver side of the Blanket is coated with metallic agent that reflects up to 97% of the radiated heat. During the hot daytime room under the Blanket will be used as a comfy and refreshing rest area, where anyone can relax, chill, have a nap or dance. At night hundreds of people in el-wire suits will get together under the blanket creating an effect of oceanic bioluminescent plankton or moving waves of equalizer. Ever since we were children and throughout our life we share the space under the blanket with lovers, friends and family. Under the Blanket there are no strangers. The project needs to raise $17,500 for materials, an excavator, equipment rental and transportation costs from Russia to Black Rock City before the end of the week. 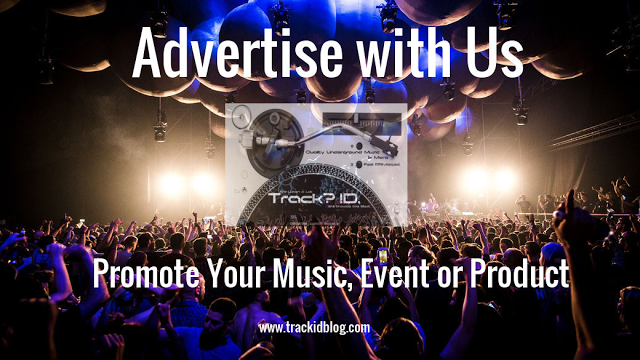 Check out the Indigogo campaign and support here.